It’s Wednesday. The light at the end of the tunnel approaches. Alarm goes off. Creativity time. On Monday she came at 9am, on Tuesday she came at 10am, and today she’ll be over at 11am. I’m noticing a trend. If this keeps up she’ll probably text me tomorrow to say that she has moved out of the country. I hear Roman announcing that he is the first to wake up. Everyone went to bed quite late last night so I imagine they will sleep in a bit. 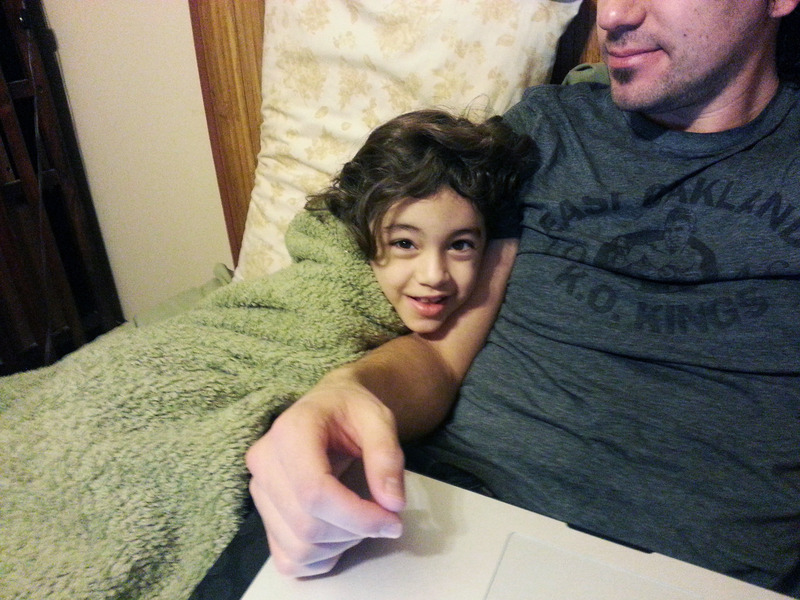 Never mind, Nola just stumbled in and cuddled next to me on our bed as I type. Don’t mind a bit. Roman can wait a few minutes. I had looked at our tired selection of cereal and oatmeal, and decided to mostly do it for my morale. Roman is letting me know that he’s hungry with his powerful lungs. He keeps bringing me boxes of rice and cans of tomatoes from the lower cabinet. “Just make this, I don’t care!” He screams. I tell him to be patient. Perfect scrambled eggs take time. And mediocre scrambled eggs probably take even longer. Now Roman is not wanting the eggs that I put my heart and soul into. Picky, for someone willing to gnaw into a can of raw tomatoes not minutes ago. I get an idea to teach the girls a song and record it for Charity. Why? Because I hate myself. I put Roman down for nap. My mom will show up at 11am so we’ve got about an hour to make this happen. I start teaching them a modified/shortened version of the song as I want them to sing it by themselves. This is wrought with fickle attitudes about their desire to participate and me trying to convince them that by doing this they will secure their mom’s love forever. I finally tell them that if we can get this done before grandma gets here then they won’t have to do school work, since that will be a music class of sorts. This arrested Nola’s attention. I decide to sing it with Nola since it’s kind of tricky. We start the recording process. God help us all. We’ve got a few takes under our belt. Nola keeps getting goofy and animated during the song. I try to explain to her that being serious as possible will make it more funny. This is surely counterintuitive to her six years worth of humor experience—which largely consists of slapstick. We finally get it finished. I’ve got a couple takes I can mash together. Nola doesn’t have to do school, she earned it. I wish I’d earned not having to do work. This was much more stressful than I thought it was going to be. It usually is. If I had thought of it sooner we would have been working on it throughout the week. That would have been smart. Grandma is here. I’m out. Trust me, you don’t want me detailing my work day. Realized I hadn’t brushed Violet’s hair in a while. We sat on our bed and started down the path. Hit some knots. There were tears. She would turn around and give me a look like, “OW! I thought you loved me? !” I’d apologize. We were halfway done when I noticed that I didn’t have Netflix going, rookie mistake. We move to the TV room. Fire it up and finish with little event. Want to take the kids out to eat. I’ll have you know that we have only eaten out once so far this week. ONCE! Of course if my mom hadn’t made us 60 lbs. of beans and tortillas that number would probably be much higher. Or maybe not. I tell ya, you really have to want to get the kids in and out of the van for something. And tonight I want to. But behold, I am behind already. I know Roman will start screaming soon and I still have to get everyone ready to leave. Our kids all have a ton of socks. But, NO TWO PAIRS ARE THE SAME! Each stupid pair’s design is stupidly different from each stupid others stupid design. We should be able to buy a ten pack that is all the same color. Then be able to blindly grab two and you’re good. 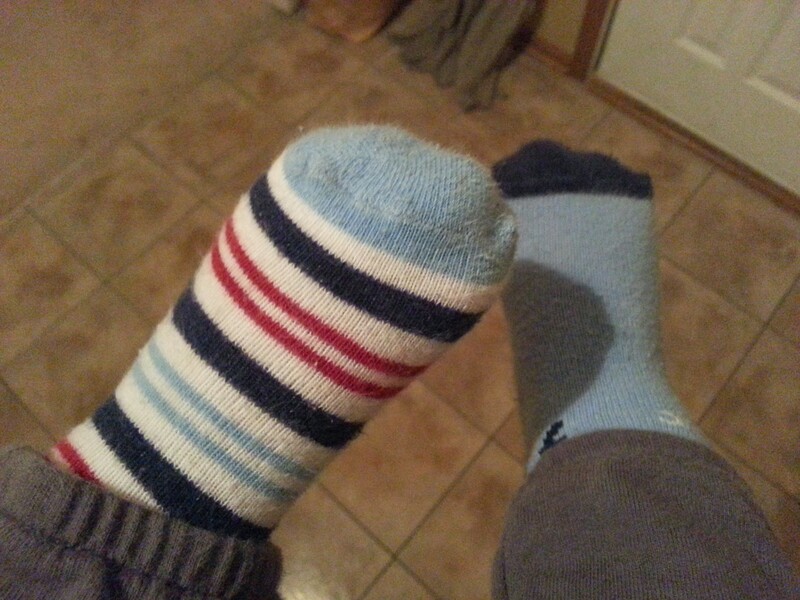 But no, I have to root through a drawer full of countless socks to find the doppelganger of the one in my hand. Of course I put about 20 seconds of my life into this task before realizing its futility, and that I no longer care. 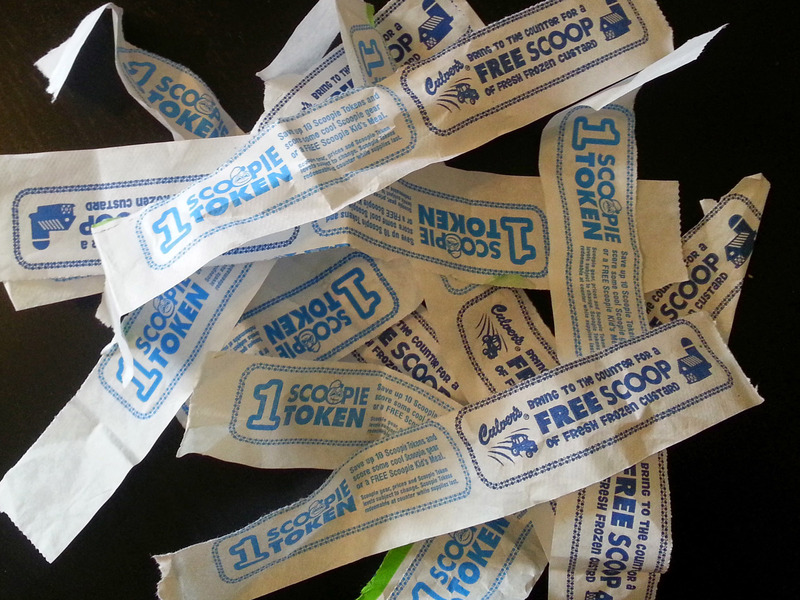 I grab a fist full of our Culver’s kids meal tokens we’ve collected over the years…*sigh*…ok…over a couple weeks—that’s not embarrassing at all. 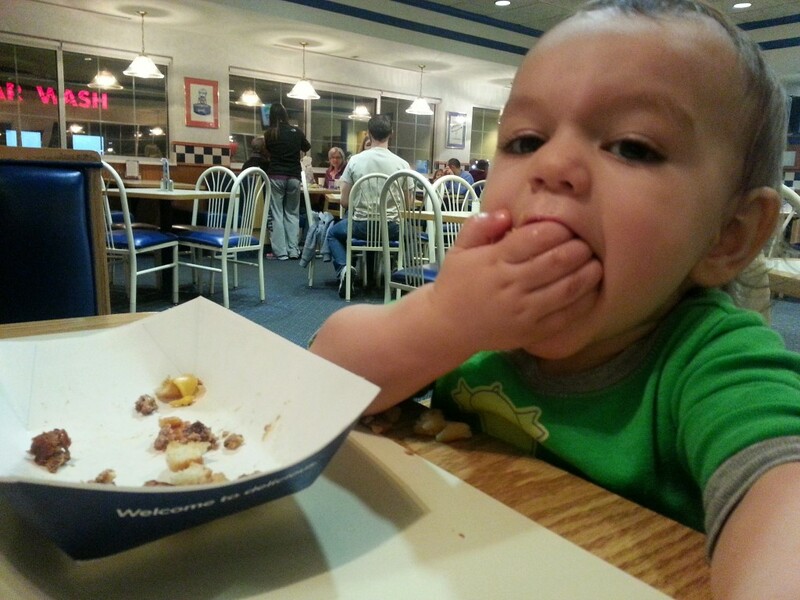 Ten tokens will get you a free kids meal. Should be able get kids meals for everyone in the restaurant. There’s more in the van. 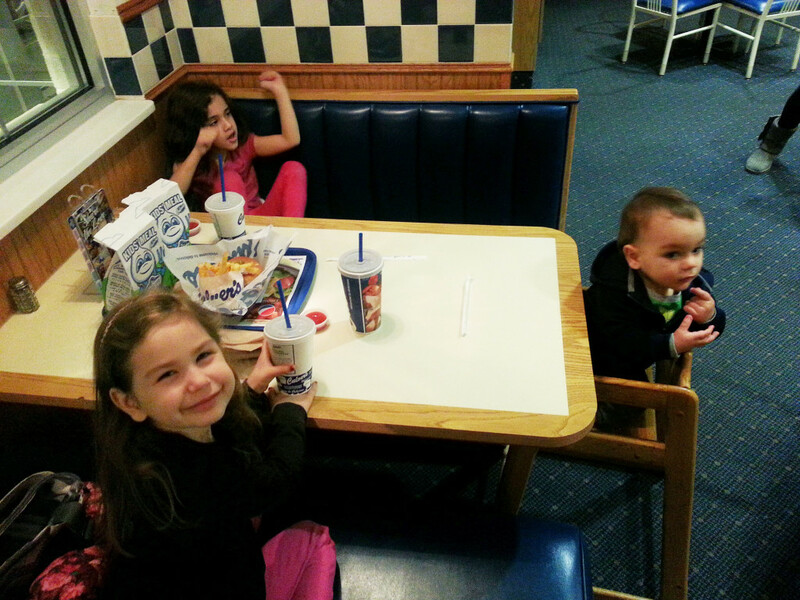 We arrive at Culver’s, get our food, and settle in. We’ll probably be here for a while. Not long into our meal Nola says she has to use the bathroom. She then asks if she can go by herself. I look at Violet and Roman, I see our food and drinks sprawled over the table, our coats and bags strewn about the booth. I can see the bathroom door. She gleefully shuffles off. A confident slice of independence in her step. I keep the other two kids progressing through their meal and an eye on the bathroom door. A few moments later Nola emerges, ten years older. Well sweet! Maybe she can take care of everyone for a while. We are mostly done eating. I gather up the “Free Frozen Custard” coupons from the kids meals and head to the counter for delicious redemption. I tell Nola that she is in charge while I’m gone. Let’s explore her budding sense of responsibility shall we. I get halfway to the counter and feel a tail. I turn to find Nola on my heels. So apparently if Violet wanted to join us then Roman would be overseeing the booth. I tell her to learn the job before delegating, and send her back. I have just ordered our frozen custard and am waiting patiently. A glance to the other side of the restaurant reveals Nola trying to heft Roman out of the high chair, for no apparent reason, and Violet wearing a greasy paper basket as a hat. I give the “parent eyes” and a few non-verbal gestures later bring everything back under control from across the room. Maybe Nola isn’t ten years older and can take care of everyone. I turn to the restaurant and yell, “Listen up everyone. I just asked my daughter to do something and she just said, ‘Sure I’d love to.’ NEXT ROUND OF FROZEN CUSTARD IS ON ME!!! WE’RE CELEBRATING PEOPLE!” And then, like at the end of a movie, a DJ appears out of nowhere, lights start pulsing, balloons inexplicably fall from the ceiling, and the whole place starts dancing as I lift my daughter onto my shoulders. We get home and a sniff by Roman’s car seat tells me that he has shown his diaper what he thinks of it. I get him to the bathroom and prepare the wipes and my hazmat suit like normal—a thought of one of those remote control robots that disarm bombs flashes across my mind, those are so cool. I peel back his diaper with fear and trepidation. And lo, it was empty. I’ve never won the lottery. But I can hazard a guess as to what it feels like. It no doubt feels like discovering a false-alarm-poop-diaper. Again, a DJ appears out of nowhere, the pulsing lights, the balloons, the dancing. You see, we do the whole Elimination Communication thing. Which is a fancy way of saying that we plop our kids on the toilet from birth. Yeah it’s kind of a hippie thing and I blame Charity for it. But after three kids I’m a believer and don’t mind at all. Especially for a number two, which Roman is now mostly doing in the potty, making a poopy diaper all the more discouraging. Oh, my gosh. I’m not sure which I loved most: The song, with those great blues moves my Violet. Or Nola following you to the counter. (I laughed out loud at that one.) Or Roman succeeding with EC. This was a great day. Really, really great.